The iPhone(s aapl) may have passed over Android in the fourth quarter in total U.S. smartphone sales, but Google’s(s goog) platform still has one key advantage: it’s attracting more mobile data newbies. New research from the NPD Group shows that 57 percent of first-time smartphone buyers last quarter chose Android handsets, while only 34 percent of new buyers purchased an iPhone. Price would seem to be a factor, since Android handset makers like HTC, LG and Motorola(s mmi) make many lower-tier phones that far undercut the latest iPhone 4S. But viewing Android’s success solely in terms of price doesn’t paint the whole picture as evidenced by NPD’s sales numbers for the iPhone 3GS, which AT&T(s T) is giving away for free with a two-year contract. The 4S outsold the 3GS five to one, despite the latter’s steep discount. The iPhone 4S also outsold the 4 – which unlike the 3GS is available on three of the four nationwide networks – by 75 percent, according to NPD. If price was the biggest factor, customers had plenty of cheap iPhone options to choose from. In addition, customers buying Android devices aren’t simply gravitating toward cheap phones. The Samsung S II and the Galaxy S 4G – handsets that measure up to the iPhone both on features and price — were the fourth and fifth best selling devices in the fourth quarter, behind the three commercially available iPhone models. Still, the average selling price for a U.S. smartphone in the fourth quarter was $143, up from $135 in the third quarter, but down from $149 year-over-year. The release of the iPhone 4S last fall is responsible for the big quarter-over-quarter bump in average selling prices, but Android seems to be driving a long-term decline in overall U.S. smartphone pricing. That could be both good news and bad news for the handset makers that feed the lower-end of the market. There’s still plenty of growth left in smartphones with less than 50 percent penetration in the U.S. HTC, Moto and LG have all been suffering in the smart device market – HTC just posted another weak quarter. While they could potentially take a big share of the remaining market by selling cheaper, lower-margin devices, they might not be able to achieve much in the way of follow-up. When it comes to buying their next more-expensive smartphones, those customers seem to be choosing Apple and Samsung. So says NPD’s latest research. not sure if i want to believe this, as Christmas 2011AD sales speak a different tune. Still it’s NPD, so i have to come with a good arguement to explain this away!!!! I chose an Android and regret it. Don’t get me wrong; I love the phone and the features. The problem is …well I keep having lots of problems and theres no reliable support. Samsung blames Google which blames Samsung which then blames Tmobile which then blames Samsung which then blames apps and the cycle goes on. Theres no reliable support – Everyone says I don’t know and is quick to point the finger at someone else. THe manufacturer says as soon as you install anything from the Android Market, your phone may not work. Its been a nightmare. Repairs, resets, more repairs, more resets. Im getting an iPhone so if I have a problem I can go to one company who will solve it and not start blaming others. Plus every single person I know has an iPhone and not one of them has had even a fraction of the problems Ive had in my 2months as an Android user. Ha ha. Look at the iSheep attempting to bend the numbers *almost* as much as iJobs attempted to cheat death by buying livers. 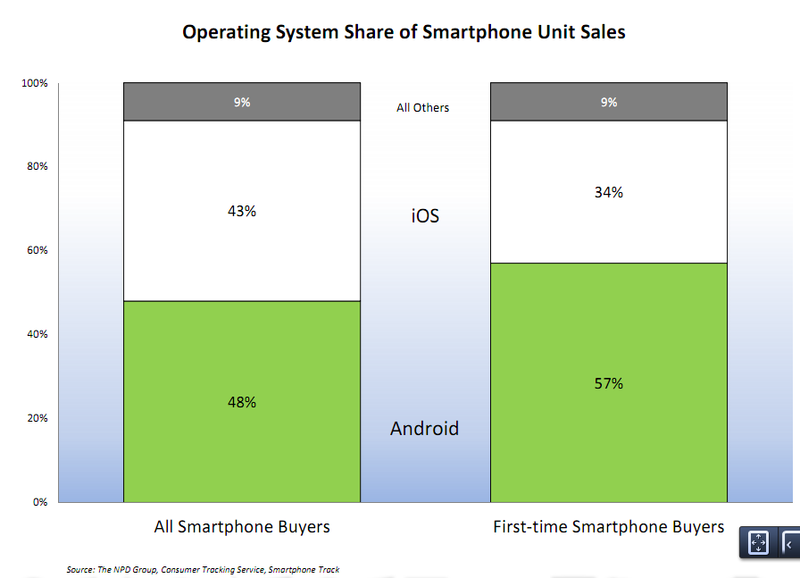 Android is the top OS of choice for both first time buyers and all buyers. Why would they want to join your twisted club? Quote below stands on it’s own. The Joker couldn’t have said it better himself. You need more “ha” to make the cackling realistic. The news here isn’t “Android is more popular among first-time smartphone buyers”, but “iPhone is more popular among second-time smartphone buyers”.